Seeing these cups I immediately thought of my students working on their final portfolios which include a couples portrait. 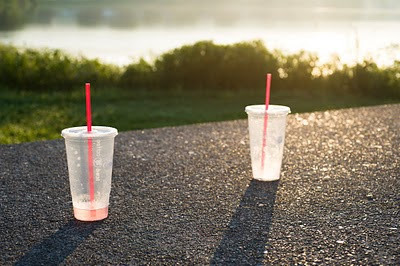 Morning dew on the tops indicated the cups had been out all night and I wondered about the pair who sat here gazing out on the Connecticut River in Turners Falls, MA. 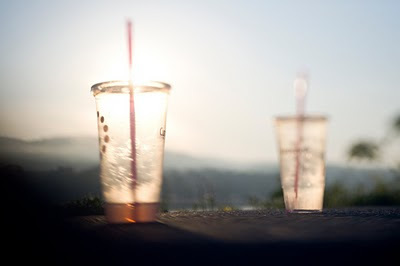 I chose this angle to backlight the items and include the misty morning river, but only wanted just the cups in focus. So I removed the lens and held it close in front of camera, creating a make-shift, tilt-shift lens, but could not get what I wanted. Like a photojournalist that gives aid after documenting his subject's plight, I cleaned up the litter. I felt self-conscious as a man reading a newspaper in his pickup truck took note of my activities. I later realized that I could have simply moved the cups to create the effect I wanted. My phojournalistic mindset is deep and I wanted to capture the integrity of the scene. The authentic story. Yesterday I saw the man in the pickup truck again. I explained to him what I do and asked him what he thought of me taking pictures of litter. As I talked, he kept his gaze as fixed on his crossword puzzle as the cigar clamped in the corner of his mouth. I was disturbing his riverside peace. "I figured it was a hobby," he replied. This Friday will be the last day that I will be at Hallmark. I will always miss our quick informative conversations that we seem to get into. I'm so glad that you do what you do and write what you write. Spreading you mind out into the world through social media will always keep me connected and will look forward to reading your posts, blogs, and tweets! Thank you for every minute of your time you have given me.